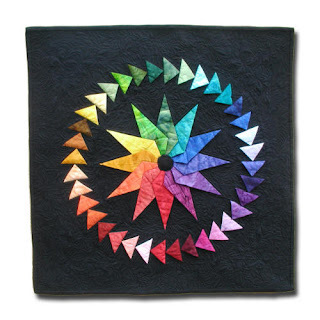 “Color Wheel Magic” by Mary Anne Ciccotelli. His tenderness was like a wound that could be bandaged but never entirely protected — like his body, so badly burned in the fire of 1945 that he appeared more wound than boy. All except his spirit, which leaked out, as if through a dark curtain pocked with rips and tears, in silent, unexpected slants of light that if looked at directly would have dazzled the eyes. The second example of this beautiful writing is when Haruko describes her girlhood friend Miko. The two short sentences shed insight into the two girls’ personalities and their relationship. If I was the routine blue sky, Miko was the twilight whose darkening colors never appeared in the same shade twice. One waited for her, never knowing which girl would appear. Two metaphors comparing personality to light, the first shining through a torn curtain, the second to a time of day. After reading them, it got my mind wandering: where do I fall on the light spectrum? Not what is my favorite color, but what hue, tint or shade is my personality? I have one friend who’s easy to color code. Her cheeriness, smile, bubbly laughter and optimism despite the drama of her life makes her as yellow as sunshine, as warm as the sand on the beach, as the sweet as the juice of a peach. I have another friend the color of sage, a pungent, yeasty green, pulling strength from its tap root sunk deep into the earth, nourishing and toasty as homemade bread. Incidentally, she’s also writing about color this week on her blog. A third friend is definitely an energetic orange, sizzling and intense with midday energy, and a fourth is the color of a delicious wine, a deep burgundy, round and rich and generous with her life. The queen, of course. In purple. I didn’t make that site! Kyna made it years ago and now everyone thinks I’ve created my own fan site replete with coloring pages and quizzes!